Nikolai Gogol was a Ukrainian/Russian satirist whose most famous tales are surreal, often incorporating veiled political and social commentary. However, his horror stories, which lovingly reflect his Ukrainian upbringing, are the ones which stick with us the most. St. John’s Eve was the basis for A Night On Bald Mountain and The Viy was the only Soviet era Russian horror film to be produced. They’re full of mischievous devils, bloodthirsty witches and spiteful sorcerers! Jeanne D’Angelo‘s Unclean Spirits is a loving homage to these frightful tales of folk-inspired madness. 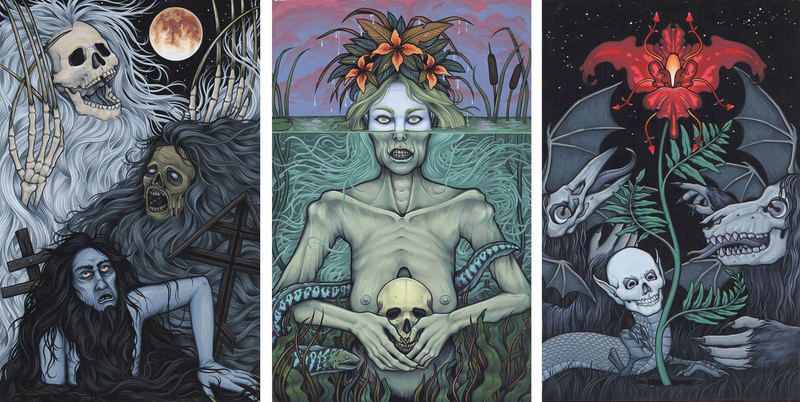 Her precise, meticulous and vibrant pieces capture the brooding eeriness present in these tales. She’s produced 15 gorgeous paintings from an array of Gogol’s work, including Viy, St. John’s Eve, A Terrible Vengeance, The Lost Letter, Christmas Eve and more. Including a four page centerfold based on the description of the Dnieper River from A Terrible Vengeance, considered to be one of the most celebrated passages in Russian literature. Including 4 page fold out centerfold. Comes with mini Illustro Obscurum Péklo Compendium. Comes with an 8.5″x 11″ print of a Vodyanoi by Andrea Kalfas. Comes with an 8.5″x 11″ print of Baba Yaga by Michelle Bukowski. Very excited for this release, D’ Angelo has an amazing vision, looking forward to her take on the hordes of hellions who hale from south of heaven.